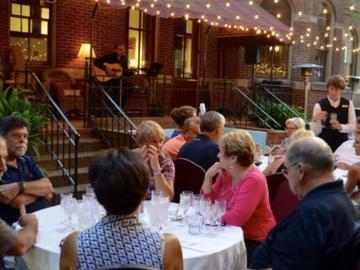 You're invited to join wine host Nick Biondi, Majestic Wines & Spirits for a night of live entertainment, wine, great food and camaraderie al fresco in our beautiful courtyard (weather permitting) on Thursday, September 27 from 6:30 - 8:30PM or in our spectacular Grand Hall at The Priory. Please note that refunds are not available, however you may be able to use your ticket/s for a future Wine Party within 12 months of purchase. And, please visit this link for more information on future wine parties and all of our events at the Priory and/or this link for our events at Mansions on Fifth in Shadyside. For questions, please contact Francine Priestas, 412.224.6300.